I also binged on two seasons of Life In Pieces. Kind of like Modern Family but much more adult and dysfunctional. James Brolin and the youngest daughter kill me. The pair of them are pretty funny. I have sped through most of Parks and Recreation last month. i never cared for it when it was on but kind of got hooked. 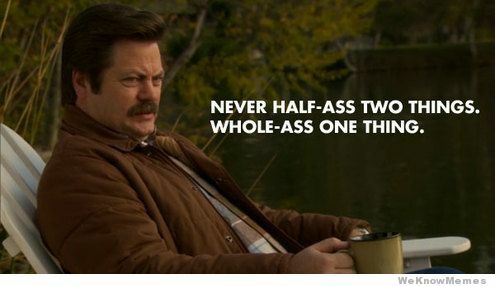 Ron Swanson is a pretty likable character. Im watching the Frankenstein Chronicles really enjoying it. I watched half of the first episode and have to get back to. It looks like it can be really good. I enjoyed Sons of Anarchy, Breaking Bad, Prison Break, Walking Dead...even though that was kinda gross. Lost in Spaaaaace! Fun and well done. Some interesting stars and cameos as well. We're on the third episode and they did a great job. I didn't realize it was out yet. I usually get an email. Will be checking it out over the weekend. Currently watching "Better Call Saul". A bit slower paced than Breaking Bad, but still an interesting watch, with many characters from the original show. OMG! It's like the first episode of every season of Worst Cooks in America over and over again. Which is my favorite show! Not all of Worst Cooks in America, but the first episode of each season. It's based on some online show where someone posts a beautiful, professionally made cake or other pastry and people at home try to duplicate it then post their results. So this series takes a new group of three people every episode who think they can bake and gives them two challenges. It's hosted by a comedienne who is also a judge and two more judges, a guest pastry chef and a famous chocolatier, Jacques Torres, who has a fantastic sense of humor and doesn't know how to use a microwave. It's a baking show for, well, the rest of us. Beyond funny. I hope they do another season. I cannot stop laughing.